General Motors seems intent on banishing all memories of the unloved Aveo - so much so that it's gone and renamed its entry-level fighter in the States. While we're still not 100-percent in love with the name (we can't get visions of spiky-haired hedgehogs out of our heads...), all three flavors of the Sonic do appear to be vastly improved over the machine they replace, though one of them, the Z Spec, is still in the concept stage. More than anything else, they look vastly better both inside and out, but until we get a stint behind the wheel we'll hold off final judgment. According to Chris Perry, vice president of Chevrolet marketing, "The all-new Chevrolet Sonic blends the practicality of a small car with the passion for driving that Chevrolet vehicles like the Corvette are known for." That won't be the only time you'll ever hear someone mention the Sonic in the same sentence as the Corvette. In fact, Chevy tells us that Corvette engineers are responsible for the ride and handling of the sub-compact. The Sonic will be available in both sedan and hatchback bodystyles and with either a 1.8-liter four-cylinder mated to a five-speed manual or six-speed automatic, or a 1.4-liter turbocharged mill with 138 horsepower that's hooked to either an automatic or manual with six forward ratios. For those keeping track, these are the same engines available in the slightly larger Cruze. You'll also get a gauge cluster inspired by motorcycles, OnStar connectivity, 10 airbags and plenty more. Read all the details in the exhaustive press release after the break, but not before you peruse the high-res images in the galleries below. 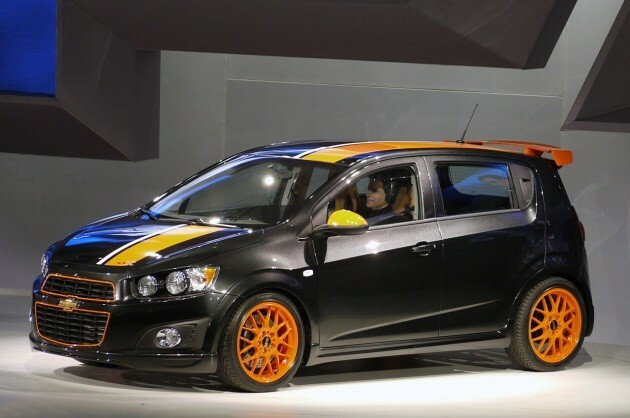 Detroit 2011: 2012 Chevrolet Sonic is not an Aveo originally appeared on Autoblog on Mon, 10 Jan 2011 19:57:00 EST. Please see our terms for use of feeds. Not long ago, our spies captured a lifted Ford Fiesta prototype, suggesting that a B-segment crossover might be in the works for Ford. 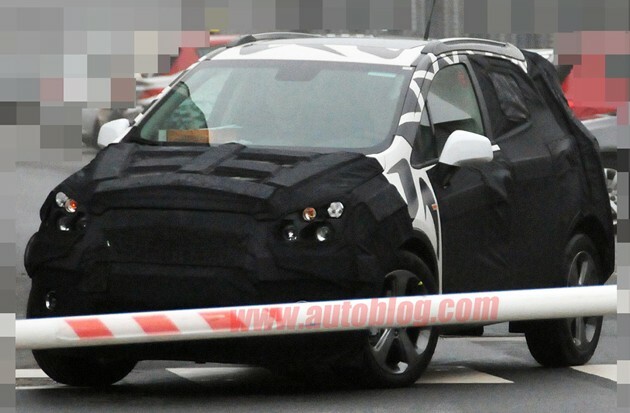 If that's the case, it looks like the Fiesta CUV will have competition when it hits the streets, as we've received this set of spy shots showing a high-riding version of the Chevrolet Aveo Sonic. Is the Sonic CUV bound for North American soil? Hard to say, but we won't be crossing our fingers for this one to arrive on our shores. Expect to see the Sonic-based crossover sometime in 2012, with both front- and all-wheel drive versions available, with power supplied by a range of gasoline and diesel engines. [source: CarPix]Spy Shots: Is there a high-riding Chevrolet Sonic in our future? originally appeared on Autoblog on Tue, 11 Jan 2011 19:24:00 EST. Please see our terms for use of feeds. Looks WAY better than the Aveo. I don't think I'd ever buy a car this small though. AWD? May be nice to see this. looks ok. but maybe make the head lights thinner. I hope they make these to a price.... I wouldn't spend more then $12K for it.